If you enjoy fishing in Alaska for King Salmon, Silver Salmon, Rainbow Trout, Chum Salmon, Pink Salmon, Sockeye Salmon, Northern Pike, Arctic Grayling, Arctic Char, Dolly Varden, Lake Trout, and Sheefish at one of the nicest Alaska fishing lodges out there... you'll love the Royal Coachman Lodge! Bristol Bay, Alaska — a land where glowing mountains tower over a magnificent landscape...where rivers boil with wild Alaska salmon. The last wilderness frontier...and the rainbow trout fishing, Alaska king salmon fishing, and fly fishing for a multitude of other species is like nowhere else on earth. When you join us at the Royal Coachman Lodge, you’ll find adventure at the end of every cast. For the angler, there’s really no other place on earth like the Royal Coachman Lodge... a true Alaska fishing paradise. 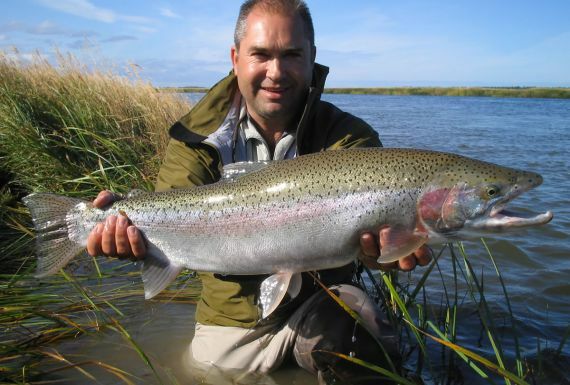 The Royal Coachman Lodge is an Alaska fishing lodge located in the heart of the world famous Bristol Bay sport fishing region of Southwest Alaska. The Lodge sits on the banks of the Nuyakuk River, a quarter of a mile downstream from the outlet to Tikchik Lake, nestled in the 1.6 million acre Wood-Tikchik State Park. The park contains 13 lakes that make up two distinct watersheds. The entire northern watershed drains into the Upper Nushagak River via the Nuyakuk River from the outlet of Tikchik Lake. 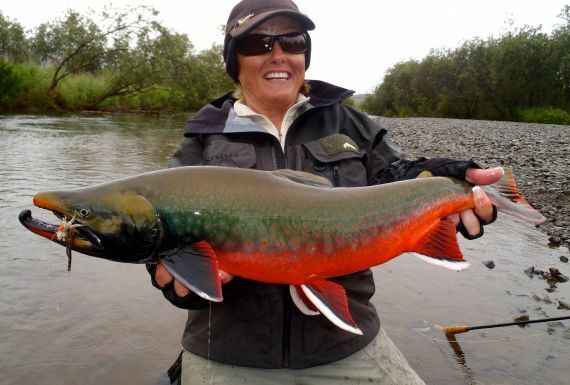 "The best fishing experience I’ve ever had – could not have a better Alaska trip. You guys are the best – great place, great staff, great food and great service. Thanks for everything." The Kilbuck Mountains rise majestically from the waters edge where the western end of the lakes probe the mountain range in spectacular fjords. The western side of the range drains the vast 4.8 million acre Togiak National Wildlife Refuge. This area of Alaska is accessible only by floatplane. Most fishing lodges in Alaska are located in small towns or native villages. But the Royal Coachman Lodge is 65 air miles north of Dillingham and totally isolated in the midst of a vast Alaskan wilderness. Mother Nature, at her undisturbed best, is our only neighbor! Although some of the best Alaska sport fishing in the area just out the front door of the lodge, this is a fly-out lodge. Guests fly in one of our two float equipped DeHavilland Beaver aircraft to remote locations throughout an area that is 250 miles east to west by 300 miles north to south. If you are looking for an Alaska fly fishing or sport fishing lodge that will cater to you every need and guide you through some of the best waters of the world, then give us a call and let us help plan a trip of a lifetime!